Rare, seldom seen items, such as part of Elizabeth Custer's original manuscript for her book, Boots and Saddles are now on display in the Custer Battlefield Museum at Garryowen. The display also includes a presentation copy of Boots and Saddles signed and inscribed by Elizabeth Custer on the inside cover; the West Point mathematics exam roster showing Cadet George A. Custer in the fifth class, section IV, his personal set of William H. Illingworth's stereoviews of the 1874 Expedition into the Black Hills and a copy of the 1876 Requiem to the Memory of Gen. George A. Custer, composed by Charles Clover. The Custer Battlefield Museum is celebrating its 10th anniversary this year. "We wanted to provide some really unique Custer related artifacts for all the Little Bighorn Days and Crow Native Days visitors to enjoy, " museum Director Chris Kortlander said noting that scholars and students are especially welcome. The museum is open 8a.m.-8p.m. daily Memorial Day to Labor Day and 9a.m.-5p.m. in the winter. The museum is located at Garryowen, Montana, off exit 514, four miles south of Crow Agency on Interstate 90. 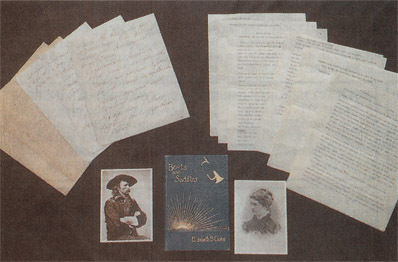 Part of Elizabeth Custer's original manuscript for her book, Boots and Saddles, a presentation copy of the book signed by her and, on the right, a script proposal from a Hollywood studio sent to her for approval. 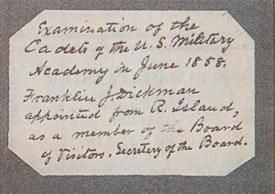 The note on the front cover of an exam notice sent to Cadet George Custer at West Point shows what class and section he would be in for the mathematics test. 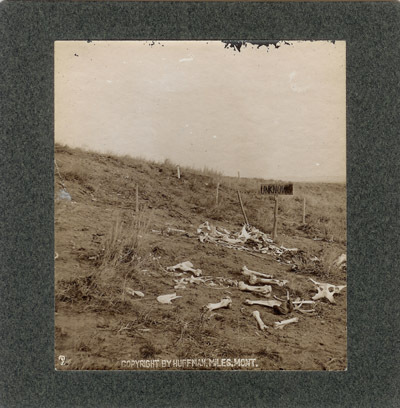 Miles City photographer L.A. Huffman took several photos of the battlefield one year after the fight. 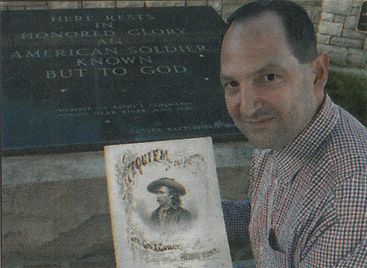 Several will be on display at the Custer Battlefield Museum in Garryowen. This one shows a grave of an "unknown soldier." The modern Tomb of an Unknown soldier is located in front of the museum.